Diabetes extract is a simple formula to help maintain balanced blood sugar levels by providing the proper nutrient exchange. Improper insulin regulation accelerates cellular damage while proper nutrient exchange and hormonal balance are essential a healthy system and optimum energy levels. These powerful herbs, such as Cedar berries and Gymnema Sylvestre, assist in glucose regulation. Bilberry provides additional antioxidant protection. Lowering your blood sugar is important to avoid pre-diabetes, diabetes, insulin resistance and overweight issues. Using plants as part of an integrative medicinal solution, diabetics can enjoy the symptom-reducing effects of a botanical medicine. With the proper diet, exercise and herbs, you can control your glucose levels easily and avoid more serious health problems. Bean Pod tea is a natural and mild detoxifier for the pancreas and other related organs. The aim of Bean pod tea is to enable the pancreas to produce its own insulin and to bring the blood sugar levels to an acceptable range, somewhere between 110-140, without additional medication. Many feel relief from diabetic symptoms such as excessive thirst, dry mouth, frequent urination, and headaches with continued use of the herb. Depending on the severity of each individual case, this tea will locate the sugars and toxins in the blood and organs and flush them out and the pancreas will start to function once againa nd produce its own insulin. 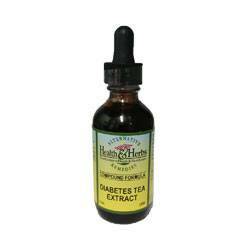 Be patient, Most will not experience instant relief with the use of this herbal extract. Bean pod tea must be taken on a regular basis for about 3 months in order to normalize the blood sugar levels. Difficult cases may need more time to see results. High cholesterol, especially when combined with obesity, may also improve with Bean Pod tea by flushing fat through the digestion system. Bean Pod tea contains amino acids such as tyrosine, tryptophan, arginine, plus B vitamin choline and the enzyme betaine.Contraindications: Do not take while pregnant. Not recommended for those with kidney stones, ulcers, hypoglycemia or man-made organs. Type 1 diabetics should not take this herb because blood sugar levels may become too low. Mild nausea is the only documented side effect. Bilberry leaf extract is one of the most popular over-the-counter herbs sold in Europe. Bilberry leaf contains anthocyanidins that have considerable pharmacologic activity. It is especially useful as anti-aging substance. The bitter compounds inhibit collagen destruction, scavenge free radicals, reduces capillary permeability, increases blood circulation to peripheral blood vessels and the brain, reduces inflammation and pain, and relieves muscle spasms. Bilberry leaf tea has an astringent action and it has been shown to reduce blood glucose. Moreover, the plant is recommended as an adjuvant for diabetes. In fact, Bilberry, rightly called "green insulin", was once used as one of the top resources for people suffering from blood sugar disorders before the discovery of insulin. The leaves contain myrtillin which can safely help to normalize blood sugar levels. Bilberry tincture has been used traditionally to improve poor night vision, bruising, capillary fragility, varicose veins, Raynaud's disease and diabetes related circulatory issues. Bilberry is beneficial for pre-diabetic patients with tendencies toward glaucoma and stimulates peripheral circulation. It is said to be so effective for the vision that a single dose may improve one's night vision within hours. Bilberry tea extract, which contains the antioxidant, vitamin C, has been found beneficial for a number of long-term illnesses such as heart disease, cancer, and macular degeneration. Bilberry leaf extract may improve collagen integrity and reduce serum cholesterol triglyceride levels which significantly impede the development of atherosclerosis.Contraindications: Currently, there are no warnings or contraindications with the use of Bilberry. However, coumarins in Bilberry, also known as Huckleberry, may increase blood thinning activity and inhibit platelet activity. Blueberry Leaf, Vaccinium myrtillus, contains large amounts of anthocyanoside compounds which have effective antioxidant properties. Anthocyanosides also play an interesting and essential role in promoting collagen synthesis. Blueberry leaf tea provides a high vascular protection for diabetics, and studies have shown that Blueberry leaf extract can significantly lower blood glucose levels. Many naturopathic practitioners recommend that people with diabetes drink this tea one to three times a day. Antioxidant-rich Blueberry leaves are also thought to combat age-related loss of brain function. Contraindications: Blueberry and Blueberry Leaves are considered safe and have no documented drug interactions. However, coumarins in Blueberry may increase blood thinning activity and inhibit platelet activity. Women who are pregnant or nursing should consult their doctor before taking Blueberry Leaf. Because Blueberries and Blueberry Leaves are known to reduce glucose levels, diabetics should monitor their sugar levels closely. It is recommended that people who are having surgery stop using Blueberry Leaf 2 weeks before the procedure. Gymnema Sylvestre is part of the milkweed family. It is known as Gurmar in Hindi, meaning "Sugar Destroyer," and has been used in Ayurvedic, or Indian, Medicine for centuries. Research has shown that it helps glucose to reabsorb into the blood and blood sugar. Gymnema Sylvestre extract contains bioactive components called gymnemic acids. Gymnemic acids possess anti-diabetic and anti-inflammatory properties. Other significant constituents include glucose and carbohydrates. Preparations from whole leaf tea may be most effective because of its hypoglycemic action, which helps to lower elevated blood sugar levels and reduce the amount of the lipids in the bloodstream. It also possesses anti-atherosclerotic action which helps keep plaque from forming on the walls of the arteries. Gymnema has several important uses and it has been noted by Dr. Michael Murray, a naturopathic physician, botanical medicine expert, and author, that it is one of the most practical herbal recommendations for improving blood sugar regulation in diabetics. Gymnemic acids help desensitize your taste buds to sweet-tasting foods when they are placed directly on your tongue. Research suggests that Gymnema leaf tea is one of the few herbs that may enhance your body's production of the hormone insulin. While Gymnema is helpful for some individuals, it should not be taken by everybody. Gymnema should not be used if you have hypoglycemia or low blood sugar levels. You should always visit your doctor before taking herbal remedies to treat your health complaints. Cedar Berries are full of health-promoting nutrients that may be beneficial for those experienceing a variety of diseases or trying to maintain optimal health. One of the greatest benefits of Cedar Berry tea is its ability to relieve digestive problems ranging from heartburn to irritable bowel syndrome, or IBS. Cedar berries also help to regulate blood sugar levels and kidney filtration, thus helping to deter the onset of diabetes. Cedar Berry tea could be most useful when used in conjunction with Gymnema Sylvestre. They improve the functions of digestive and pancreatic systems. Juniper berries , used by natural healers for many years may help manage blood sugar levels and decrease glycemic levels by increasing the secretion of glucose-induced insulin. Recently, the possibility of using Juniper berries as a part of the regimine for diabetes has been researched and found to reduce oxidation of kidney and liver tissues. Juniper berry extract increases liver circulation and reduces injury to the liver tissue. A natural diuretic, antiseptic and anti-inflammatory Juniper berries contain a fatty acid that behaves much like that in fish oil. They have antimicrobial properties that help treat urinary tract, bladder, and kidney infections. They also aid in removing wastes and acidic byproducts and excess water from the body that may result in weight loss.Contraindications: One should be extremely careful with the dosage and its consumption. The USFDA does not recommend this herb as safe, and prolonged use (more than a month) is not recommended, as it may cause kidney damage. If kidney disease is suspected, Juniper berries may over-stimulate the kidneys and adrenals and should be avoided. Pregnant women should not use Juniper Berry because it stimulates the uterus and may cause unwanted abortion. Women who are attempting to get pregnant should avoid Juniper, as it can result in lowered fertility chances and it causes uterine contractions. Juniper should not be used in cases of heavy menstrual flow, and the herb may interfere with the absorption of iron and other minerals. Some people may have allergic responses to Junipers, so test on a small area of the skin. The oil of Juniper should never be used on an open wound, as it could cause swelling and irritation. Ingredients: Bean Pods, Bilberry Leaf, Blueberry Leaves, Gymnema Sylvestre Leaf, Cedar Berries, Juniper Berries, Structured Water, 20% Alcohol. Non-Alcohol: Bean Pods, Bilberry Leaf, Blueberry Leaves, Gymnema Sylvestre Leaf, Cedar Berries, Juniper Berries, Structured Water and Vegetable Glycerin.